The Spruce Railroad Trail skirts Lake Crescent and is inside the boundary of Olympic National Park. The trail is a 4-mile rolling path in the woods along the shores of the lake, which is the second deepest in Washington at 600 feet. The Spruce Railroad Trail has been designated as part of the Olympic Discovery Trail that runs from Port Townsend to Forks, WA. The Olympic Discovery Trail is a multi-use trail, similar to the Burke Gilman Trail in Seattle, and the trail system is open to dogs. This has created a loophole for people who want to hike with their dogs inside of Olympic National Park. Unlike most National Parks that only allow dogs along roads, in parking lots, and in campgrounds (well, some do anyway), Olympic National Park does have a few opportunities for those traveling with dogs. As far as trails go, dogs were previously only allowed on the Peabody Creek and Madison Falls Trail. However, neither of those trails really give you a true park experience. The Peabody Creek Trail is short at 0.5 miles round trip and is similar to other wooded urban parks here in Western Washington – it’s nice but not spectacular. The Madison Falls Trail, at the Elwha River Park Entrance, is definitely worth a visit but the “hike” is only 200 feet along a paved trail. The loophole has now given dog owners access to hike a really cool trail in the park – the Spruce Railroad. IMPORTANT UPDATE: According to the Washington Trails Association, the “Trailhead access limited: The Spruce Railroad Trail Improvements project will limit access from the eastern trailhead from July 27 to the end of October 2015. Access is still available from the Camp David Junior Road trailhead. The trail follows what was once a 36-mile rail line built during World War I to haul Sitka spruce-once coveted for airplane manufacturing-to mills in nearby Port Angeles. The railroad never served its intended purpose because the War ended days before the line was completed but it did serve commercial logging interests for thirty-five years. The trail is very scenic. Mount Storm King – elevation 4,537 feet – looms over the lake to the southeast. The water is an incredible, sparkling blue. The trail winds through a corridor of maple, sitka spruce, hemlock, and countless other types of trees. Beach access is possible at several points, though occasionally hikers find themselves high above the lake, peering down nearly 40 feet into its crystalline blue waters. Rumor is that the trail will eventually be redeveloped similarly to other parts of the Olympic Discovery Trail and, when it is, it will be wide and paved and look more like other Rails to Trails pathways. In my opinion it will be “ruined”. I wanted Chester and Gretel to be the first dogs to scout the trail before its current beauty disappears (we jumped on this new opportunity as soon as the ink dried on the Olympic Discovery Trail easement). We headed to the Olympic Peninsula on a brisk, sunny Sunday. We couldn’t have asked for nicer weather. We headed out on the Spruce Railroad Trail to the famed – locally anyway – Devil’s Punchbowl. Chester and Gretel were in a hurry to see this place for the first time – running fast and sniffing every stick and rock (Watch them jump the streams). When we finally got to the Punchbowl we took a break for a snack, a little rock climbing (yes, actual rock climbing. Chester saw something up there that interested him and up he went) and a photo op. 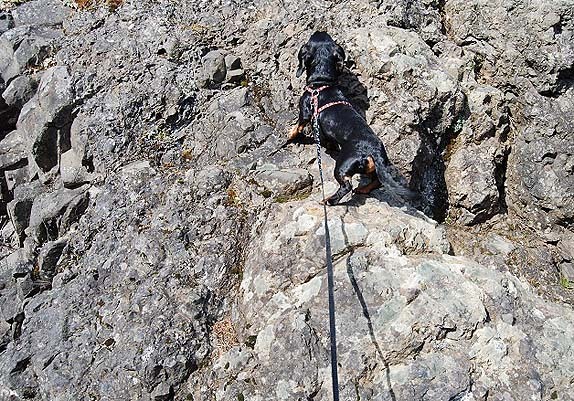 Chester Climbing the Rock. Seriously, I did not put him up there. We do admit that we are likely not the first dogs EVER on the trail since humans have disobeyed rules since the first one was created but it is sure fun to pretend we were pioneers! If you are looking to hike around Olympic National Park with your dog, you will also want to check out the Upper Big Quilcene Trail to Marmot Pass. It’s our favorite dog friendly trails near Seattle and one of my favorite dog friendly trails for overnight backpacking. 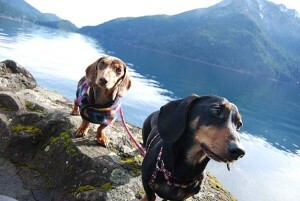 There are several dog-friendly trails on the Olympic National Forest that surrounds the Park. If you plan to hike in the area, please check out this post from our local friend over at ExoticHikes.com – Our 5 Rules for Hiking with Dogs in the Olympic National Forest. Yay! Thanks so much for this terrific post. We’ve been so disappointed during our travel planning to discover so many of the National Parks do not allow dogs. I’ve made a note that Gus can come with us on this trail! It looks awesome! love seeing gretel and chester, romping free, ears flopping and trekking through the woods 😉 you are a very dedicated adveturewiener mom! Well, I hope Gretel is having more fun now than she ever has. That is what life is about right? Thank you for this great info!! I was searching for a place to hike with my dog in Olympic National Park, and found your posting. I just visited Spruce Railroad Trail couple of days ago, and it was AWESOME:) My dog was all excited about her first hiking experience. Oh, there was no sign of “No pets” anymore. I had my hopes up after watching your sweet little ones hiking the Spruce Railroad trail. 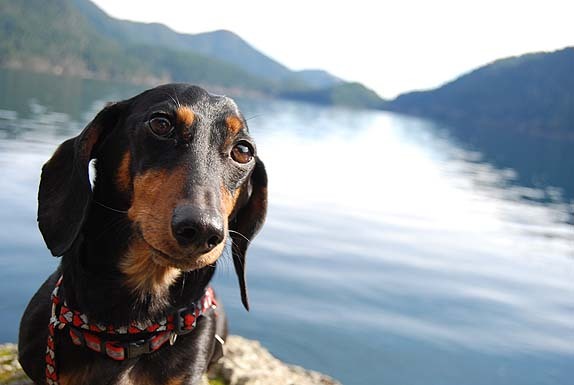 I am planning on taking my little dog camping at Lake Crescent this coming weekend and I have found conflicting information on the internet as to whether dogs are now allowed on this trail. I just called Olympic National Park and they told me in no uncertain terms that dogs are NOT allowed on this trail and it is not yet part of the Olympic Discovery Trail. I will still take her kayaking but I really wanted to take her for a hike. That is news to me. I went in person to the Hurricane Ridge visitor center and was told by TWO people that dogs WERE allowed. While we were hiking I saw several dogs on the trail. Also, the last report I got (which was a couple of months ago) was that the “no dogs allowed” sign had been removed at the trailhead. I am curious who you spoke to. Although this trail is not fully developed as the the rest of the Olympic Discovery Trail, the official documents HAVE been signed designating it as a link in the regional trail. There was even paperwork hanging at the trailhead stating as much.They may have changed their policy back since we hiked it to discourage dog owners from going. There is no doubt that there is conflicting information out there (that is why I tried to clear it up once and for all with this post) about this trail and I am wondering if you got mis-information. I used to work at the Park and I know of some people there that would tell you they aren’t allowed as long as they possibly can because they don’t like the idea of dogs mixing with wildlife. If I were you I would call back and ask someone else to see if you get the same answer. Either way, I am going to contact them again and confirm one way or another. Thanks for the heads up. Thank you for your reply. I didn’t get the name of the person I spoke with. I am taking my dog with me and will give it a try. I really think she would love this hike. Thanks again. I’m not sure what you are all talking about, but dogs have always been allowed on this trail. At least for the last 10 years. it’s famously dog friendly, and I’ve had my dogs hiking on this trail many times a year since 2008. I used to work for Olympic National Park (about 1994 to 2001). While I don’t doubt that some people took their dogs on this trail and never got in trouble for it, it wasn’t officially allowed because the trail is inside a National Park. Even when the trail became part of the Olympic Discovery Trail, it took a while for the Wilderness Information Center (WIC) in Port Angeles to catch up and stop telling people that dogs weren’t allowed when they asked.